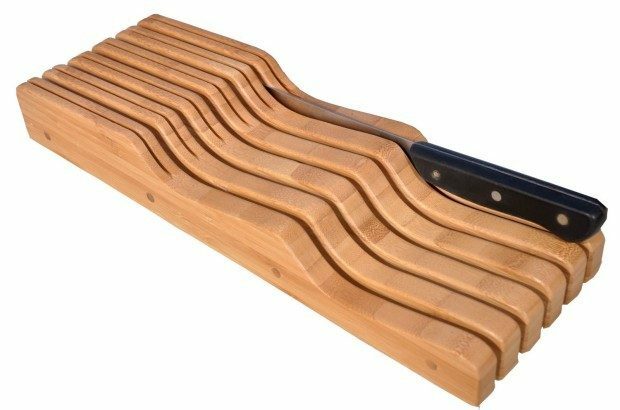 In Drawer Bamboo Knife Block Only $18.99! You are here: Home / Great Deals / Amazon Deals / In Drawer Bamboo Knife Block Only $18.99! I’m ready to scrap everything off my counter and start fresh, but I need some help with storage. I’m going to try an In Drawer Bamboo Knife Block for Only $18.99 from Amazon! Organize your cutlery in place and keep your fingers safe with this beautiful bamboo in-drawer knife block. It holds up to 16 knives. Constructed by Eco friendly bamboo which is durable, strong and versatile.